I’ve recently discovered I’m very interested in acting. With Emma having gone through the Mode Elle program she and I both were introduced to the world of acting (and modelling, but I’m not as interested in that.) Emma and Mode Elle have since parted ways (you can read about that here) but in my short role as a stage mom I’ve discovered the world of background acting. I have a category on the blog devoted to our acting and modelling experiences. Take a look at it here. Often after I participate in a shoot of some sort I’ll muse about it in a post. I try to keep my readers abreast of my tiny footsteps into the world of stardom! I have participated in a few productions now. One I even got paid for! I worked with Curious You on a promotional piece, Older Adult Strategy Case Video. Slinger Pictures used me as a featured extra for their film Sir John A and the Curse of the Anti-Quenched. This film premiered at the Kingston Canadian Film Fest in March 2017. Celtic Kitchen Party was filming a music video locally, so I got to be a parishioner in their Amazing Grace video. 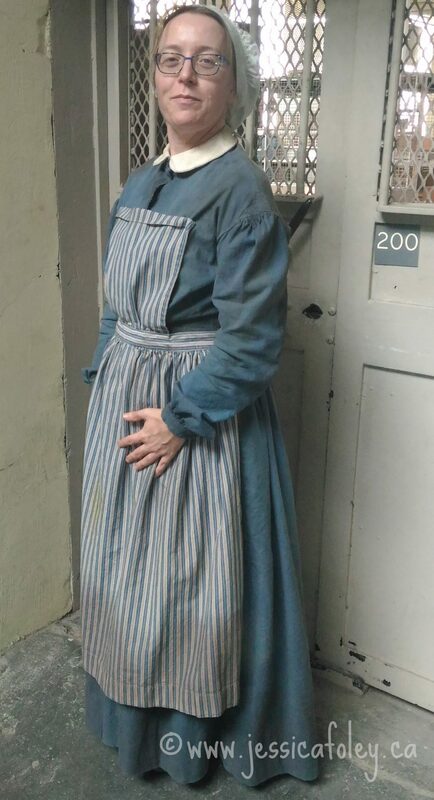 I was hired as a background actor for the miniseries Alias Grace, based on the Margaret Atwood novel of the same name. I’m a female inmate. This miniseries premiered in the fall of 2017 and should be available on NetFlix. A short video, Tricks or Treats, filmed on Halloween by a Queen’s film student. Watch it on YouTube here. Acting is a ton of fun. So far there hasn’t been anything too serious, or too difficult. I’m hopeful I can continue to find fun bits to play in the future. Be sure to keep up with me on IMDB. I have my own page there! Whenever possible I try to include Emma as well. At first they thought they could use her at the Alias Grace shoot, but they ended up not using children after all. Emma has her own page which outlines her acting/modelling experience. Please contact me if you’re interested in working together. My schedule is fairly flexible and I will take time off work. I’d also be happy to be an unobtrusive photographer for your behind-the-scenes photos. You can read more on my photography page.